Great Client Reviews Is Why We Love What We Do! Having a Personal Styling Session can be exciting yet very daunting. Our focus is to make our client at ease as quick as possible so she can enjoy the style experience. Great client reviews are what makes our business tick as we know we have done a good job of giving our clients confidence and a wonderful experience. We are not there to judge but to share all styling knowledge so she feels more confident about how she looks. We have witnessed jumps of exhilaration, squeals of joy and very big smiles in the change room. Looking after you is a great honour! We love it when we receive messages from our clients that they enjoyed their style session. It is a private time for them hence we do not take pictures during their session. No one likes to be on the Internet without the best lighting, great make up and a nice blow dry. What you will see below is a selection of images of our VIP clients who were treated to a make over. And I thank each and every client for their permission to publish their thoughts from the heart. The beautiful Sue Still has transformed herself in retirement. Click here to read her story and see her before and after pictures. This beautiful lady in her mid 30’s booked in to discover what Australian brands suit her. Coming from the UK she was struggling to find what worked for her here in Sydney. From colour to styles to fits, we covered it all during her 2 hour session. It is always such a great feeling when a client has the best experience and puts her joy in words so eloquently. Honey booked in for a wardrobe styling, style portfolio and a personal shopping session for which we booked one of the gorgeous @Myer styling suites just so we had a lovely place to work from. 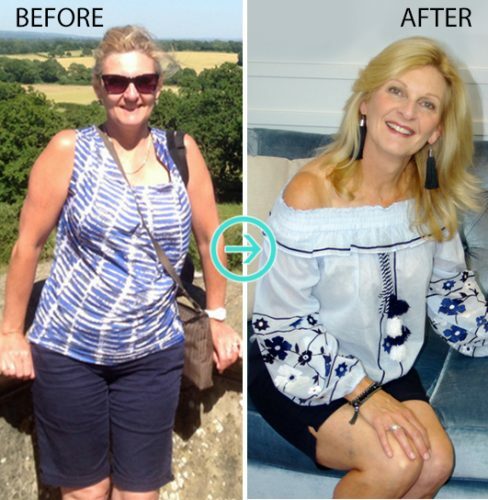 “When I saw Angela’s website with some photographs and read the information, I thought, this is the Consultant I wish to see, I don’t want anyone else! And what a dynamo she has turned out to be. From the beginning when she went through my wardrobe to the time I met her in Myers with a bundle of clothes over her arm, she has been an absolute joy in every way. I’ve acquired some absolutely gorgeous clothes, not to mention compliments flowing in from both husband and friends! And I now have lots more knowledge regarding how clothing fits and what suits me, and what to look for regarding the cut and colour. Also I would like to add that you have so much more than the initial consultation and wardrobe update, as Angela will keep adding to Facebook, Pinterest, etc. with items which have caught her eye! “Angela from Style Angel is just amazing. She maximises the effectiveness of your session by being able to assess your individual style and to match it with what is in the shops almost instantly. However, she then adds real value by taking you outside your comfort zone with suggestions that I personally would never have even considered but when you try them on you realise they suit you and make you feel great! “I want to say how much I enjoyed our couple of hours together on Saturday. It was so enlightening and I learned some things that I know are going to give me some real benefit. Worth every penny! Added to that your knowledge and manner were really excellent, and although I knew that Shelley would only be recommending the best, you exceeded all my expectations and I thoroughly enjoyed the afternoon. 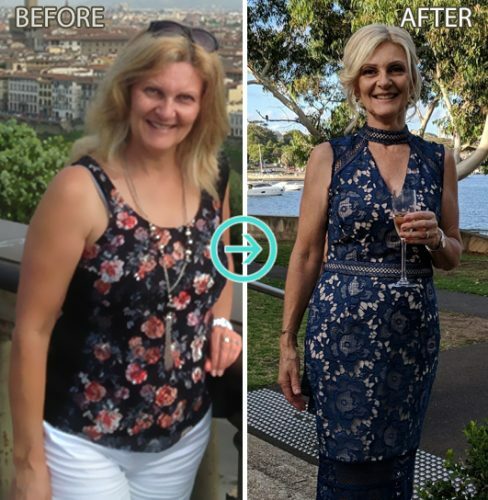 “Angela helped both my husband and myself. She went through the clothes that we had in our wardrobes – organised them as well as worked out which things really suited our bodies and colouring. She then went ahead and worked out where there were gaps in our clothing. “Thank you again for the session I had with you. It has really helped me a lot. I find I don’t get tempted to buy clothes near as much as I used to and make wiser choices now. “I’ve always wanted to get my colours done and my Colour and Wardrobe experience didn’t disappoint. The two hours with Angela was so much fun and exactly what I needed. Her friendly approach makes you feel instantly relaxed in the comfort of our own home. It was so interesting going through the coloured scarfs to see which colours would suit and which colours didn’t. We then went through my wardrobe to see what I had that would work best me, this then gave me the chance to have a good clear out to focus on the best colours and fit. As a added bonus we also went through the best makeup colours for me and Angela showed me some invaluable make up techniques. “Angela I just wanted to thank you for the gorgeous day I had with you. I felt so spoilt having my own personal stylist for the day and I loved being able to go through all of the clothes in store (something I have never done before) and really consider if I liked them. I appreciated buying items that fitted properly and were not a size larger as I would have normally selected. I have received many compliments, asking if I had lost weight even! “After 3 years wearing Maternity or “Breastfeeding-kind” clothes having had two kids, I wanted to feel more feminine again. Angela was inspirational. She took a quick look through my wardrobe told me what “gaps” needed filling and listened to my needs. Then we went off on a shopping trip to Chatswood that left me feeling like Julia Roberts in Pretty Woman. With just a few core items for my wardrobe and some great fashion accessories plus other bits and pieces Angela transformed my wardrobe. Every item Angela picked for me, even if I was a little hesitant, once I tried it on it made perfect sense and looked great! Later that day I put on one of the outfits that Angela had picked out for me and I received numerous compliments from my partner and friends we met that evening. It gave me such a confidence boost! 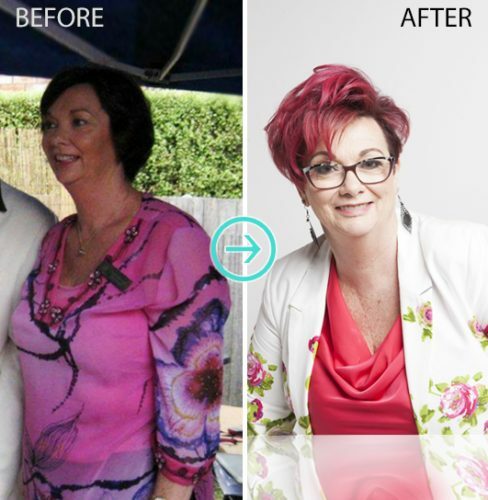 I was so inspired by Angela’s choices that I had Angela come back a week later for a wardrobe makeover, which was great! She helped me clear out a lot of stuff, but better again she showed me how to mix and match items that I would never have put together in my wardrobe and would have probably thrown out or never worn again. My wardrobe is now still functioning as it did when Angela styled it (you’ll be glad to hear Angela! ), it has taken the stress out of finding items to wear and match and the layout is just great. I’ve raved to all my friends and family about my two experiences! Cannot recommend Angela enough, she gave me a boost when I needed it most. Leave it to the expert she certainly knows her stuff, plus she is such a lovely person to deal with. “I recently took early retirement after working in a corporate environment for more than 34 years,” says Sue Taylor, a lover of golf. Sue Taylor now feels confident about her casual wardrobe. Sue met with stylist Angela for the first time at the Penrith Diana Ferrari store for a style session. Sue knew there was more work to be done and loved her Style Angel wardrobe styling and make up lesson. Kelly from Penrith booked in for a Style Session. Sarah from the Hills District booked in for a Style Session. “Thank you so much for your time, help and advice on Thursday. I had a great time and found it so helpful! I love the pieces I came home with and feel so much more confident in re-building my wardrobe with basic key pieces, fun on-style clothes and accessories too. “Thanks so much! I had a lovely time during my Style Session Erina. You put me completely at ease and I thoroughly enjoyed my time with you. And on top of that I came home with some really useful additions to my wardrobe and I have a better idea of what I need to look for in the future. So I am feeling a lot more confident with my wardrobe choices and I am excited about dressing-up in my new outfits. 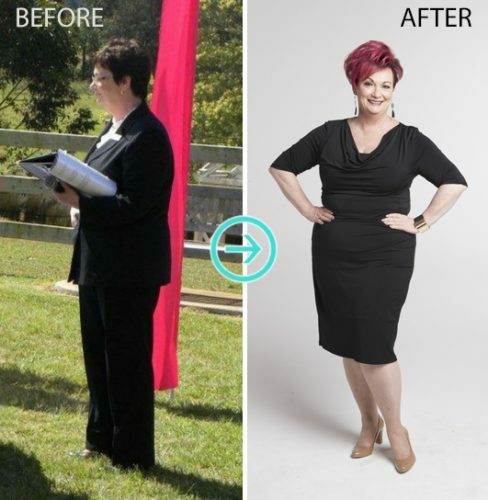 Marriage celebrant Narelle Murray was one of Style Angel’s clients who struggled with her shape and issues with her knees and feet. She was diagnosed with multiple sclerosis in 1997 and never gave much thought to what she was wearing. “I hated my body and I always wore baggy, mainly black clothes – I looked like the Vicar of Dibley,” says the 63 year-old, who lives in Sanctuary Point. But all that changed after working with Angela Barbagallo. She not only helped her in an aesthetic sense by encouraging her to wear colour and fitted clothes, but also helped her career. “Thanks for the email Angela, I had a terrific time and am enjoying the new clothes. It was a great experience and I think it is good to have an independent viewpoint. More importantly you really tuned in to my style and personality very quickly. Rosemary Shapiro-Liu now oozes confidence. When Rosemary Shapiro-Liu had her child at 46 her body changed dramatically. She had been a dancer for many years but post-baby her body changed to a more maternal, hourglass figure. “My job requires to speak in front of large audiences, so I need to feel confident and comfortable with how my new body looks” says the Author and Coach. “Angela gave me some fantastic guidance. She taught me that small tweaks can have a big impact on the way you look. “Would highly recommend this experience. Angela’s feedback was honest and thoughtful whilst considering my desired outcomes and concerns for my new look. My two hour session was conducted efficiently – no time wasting just down to business. I tried on a number of outfits in a short space of time – most look fabulous. “Thank you, thank you, thank you! I really enjoyed the experience and you taught me a lot. Now I have a bit more courage now to go and try things on. Firstly looking at shape and colour more so than deciding straight off that I don’t like something when I see it on the hanger. I love the clothes I have bought, and I will be back for shoes. I found your advice very good and sound, and I would not hesitate to recommend you to others. And I think I tried on more clothes in the 2 hours than I have since I arrived in Australia 8 years ago! Thank you again! I hope you have a lovely weekend, and hope to see you soon. This was great – I thought I had an idea of what suited me – it turns out I was on the right track!! Angela really made me feel special and helped me to narrow my ideas on what works and what colours are best. Very exciting and I felt very special walking around the shops with my own stylist!!!! “I wanted to say THANK YOU for the most wonderful, exciting and learning shopping experience I have ever had. I can’t stop telling everyone about it. And two days into the office, I was stopped as I walked in the door by the girls and questioned; “Have you had a make-over, my god you look great”!! “I really loved our session on Saturday! I feel like I learnt so much and my eyes have been completely opened to what I should and shouldn’t wear! And I guess now it will be a case of putting it into practice over the coming months and years. My mum and I would also love to do another session when summer comes in, to get your opinion on summer clothes. Then I’ll be all kitted out! Afterwards, I went home on Saturday and emptied my wardrobe and split it into what I should get rid of, what I should keep until I can replace it, and what I should keep longer term. And I also ordered everything according to colour and style so I’m definitely more organised! “Thanks for the email Angela, I had a terrific time and I am enjoying the new clothes. You really tuned in to my style and personality very quickly. Lisa from the Central Coast booked in for a STYLE SESSION with her 3 friends. “We were impressed by your efficiency, professionalism and directed approach. It allowed for a critical review of Andrew’s existing wardrobe and an opportunity to learn about available styles and brands which would suit and compliment his looks. An important part of the process was learning to have the confidence to attempt different looks and styles as well as understand what properly fitting clothes should be. “I would like to say thank you to Angela. Amazingly, I was treated like gold while I was there and it was an invaluable experience in terms of knowing what colours to wear and what styles suit me best. And I have received several compliments already and have even made some more purchases, feeling confident in knowing what to look for when shopping for clothes. “WOW what an amazing experience!!! I was anxious to start with and had many concerns about spending the money, was it over indulgent, and would Angela ‘get my style/non style’, but I can honestly say its the best investment I have made in a long time. During the Wardrobe Styling, Angela helped me to make the hard decisions about what should stay and what should go or was worth altering. The shelves were definitely a little bare so that week I booked Angela for a shopping trip. Not only did I come away with some amazing outfits/pieces I also learnt so much about how to shop. Angela was also amazing with pairing things back to what she knew was in my wardrobe at home. Shopping has been my arch nemesis for many years but since our trip I have been shopping successfully on my own and even had 2 girlfriends ask me to come and help them, which of course I used Angela’s tips and tricks. Thanks to Angela’s brilliance I now feel much more relaxed about what to wear and way more confident when I walk out the door. And I have to say others have definitely noticed the difference. “With my wardrobe, I always felt like there were some gems in there but lost among a whole lot of clothes that do not fit or do not suit or were on sale and still have tags on. I was really looking forward to getting some direction about what to shop for, colours that suited me and to put an end to me buying items that look great on the hanger but unflattering on me. “From the first phone call confirming my gift voucher had been processed, I felt that you were extremely professional and efficient. You went to work quickly, without much small talk in order to maximise the 2 hour wardrobe consultation. You did not make suggestions that would result in spending more money, but rather helped me “shop in my own closet” and created new combinations or showed me how to update items that I already had. “I had a great time with you the other Saturday. It was interesting when you went through my wardrobe and explained the sort of styles I should be wearing. And I could see where I had gone wrong with my tops and shirts and where I had gotten it right. It was so much fun going shopping and trying on things that actually looked good and fitted properly. I have not enjoyed shopping like that for a long time. I was so happy with everything I purchased and my husband was delighted with them as well. He said that he could see how happy I looked and when I tried them all on. And he just kept saying how they all make me slimmer and how good the colours were. Consequently, I have now worn most of my new work clothes to work and have had plenty of comments about how nice I look and I feel so much more confident. So much so, I do not feel like I have to hide under big tops anymore. Sue from Guildford booked a Style and Colour Workshop and a Wardrobe Styling. “I found the experience a lot of fun. We came as a group my best friend, sister and daughters to share the experience. I found that in general you already instinctively go towards the colours that suit you but would not have the range I found in the colour portfolio and personally I had no idea how to put them together for the best effect. The wardrobe styling allowed me to throw out the things that really I did not wear. Now I can look around for better colours and shapes to fill the void. Angela, you know how to make people feel at ease and comfortable even though some of our topics, like problem areas, may be sensitive to some of us. Joanne from Roseville received a Wardrobe Styling and Style Session which took place at her home and Westfield Chatswood. “Angela- you have done wonders to my wardrobe in just 2 hours! It was great going through my clothes with you, and deciding what worked and what did not. And I never thought I would have so much fun shopping, let alone be so productive in only 3 hours. But I now have the knowledge of the styles and colours that suit me, so my future shopping experiences will be enjoyable and more efficient. And I love all the clothes and accessories we bought together and have already started wearing them. “I want to say that the 2 hour shopping experience I had with you recently was fantastic! You were very professional,honest, knowledgeable and very helpful in getting me some new pieces for my wardrobe. “Angela, thanks for your great style consulting and personal shopping assistance. Before working with you, I found I was concerned with how I looked and I did not have much sense of what clothes worked together, so I stayed with basics I knew, which were frankly a bit boring. Now, I feel much prouder and more confident of how I look and I get compliments on my dress and appearance I never used to get before. Yesterday, I met a woman I have not seen for several months and the first thing she said was “Wow, you look fantastic!”. I have clothes that really fit me well and can be business elegant or casual, funky and fun. I feel in style and younger looking, which is a great thing. And with your guidance, I have a whole new appreciation for dressing in style and I am much more conscious of what outfits work well for business, casual or fun outings. Tanya from Turramurra won a STYLE SESSION which took place at Chatswood Chase. “You went through the whole of my wardrobe and my ‘to throw away pieces’ and revived several of them. And you explained in detail about how getting the colour right goes along way to wearing the right clothes for you. It was good to find that I was spot on with some of my wardrobe and then you showed me how to put outfits together which I would have never dreamed of. Talk about “shopping in your own wardrobe”, it is so true!! I then decided to replace some of my items with good key pieces so again enlisted your help. You was right on the mark knowing which shops would suit me in both cut and colour. And I learnt plenty about shopping which I can use in the future. And we managed to gain the majority of the items and a bonus of 3 pairs of shoes which all fitted and are great additions to my wardrobe! You made it all so easy! We looked at clothes I wouldn’t have even thought of picking up (love my purple shirt dress!!). Philippa from Kingston ACT booked in for a STYLE SESSION which took place in Sydney City Centre. Lisa from Croydon booked in for a STYLE SESSION given to her by her Husband which took place at Westfield Parramatta. “I wish I had have known about Angela sooner! I bought more clothes in 2 hours that suited my colouring, my shape and my personality than I had managed to buy over my entire lifetime. And I came away with an entire wardrobe of clothes, shoes and accessories that feel amazing. Together with an idea of what type of clothes suit my colouring and shape. And I have the confidence to try something different..all in 2 hours of shopping!